A GRANDFATHER CLOCK. A GLASS LOCKET. A POWERFUL CURSE UNLEASHED ON CHRISTMAS EVE. Twelve-year-old Kitty Wigeon can’t wait for Christmas at St Flurries, a grand old manor house in the countryside, until one chilly night she vanishes without a trace. One hundred years later… Still grieving over the death of their mother, Kes Bunting and his younger sister Star, are sent to live at St Flurries. They find a house steeped in mystery and brimming with secrets. Who, or what, is making footprints in the snow? And what evil force is taking a cold grip on Star? Wrap up warm as you join Kes, and a cast of eccentric snow creatures, in a race against time to solve a hundred-year-old curse. Will he succeed? 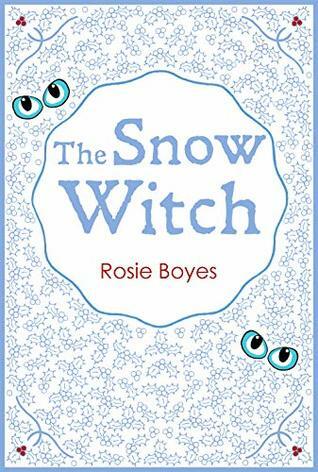 Or will the fate of his sister be decided by a shivery kiss from… the Snow Witch? Kes and Star Bunting have just lost their mother. They are looking at living in foster care since no one can find their drunken, gambling father. But they are rescued by their grandmother that has spent her fortune trying to find them. They go to live at Granny Bird’s house St. Flurries. But after spending all of her money she cannot afford to care for St. Flurries any more so has decided to sell it. But the house seems to be haunted. One hundred years earlier, Kitty is a little girl at St. Flurries that disappears. Everyone thinks she has died but she has really had a curse put on her by a witch. The story then bounces back and forth as we follow Kitty, Kes and Star as they try to find a way to break the curse that Kitty is under. This is a wonderful story that will appeal to kids and adults alike. You have a great story about a brother and sister that find they are not alone in the world and that St. Flurries has more going on than what is first seen. I loved how the story moved back and forth through Kes and Star and followed along with Kitty so well. This book is filled with magic, a great mysteries, and a creepy/wonderful house. I think anyone would enjoy this story.